With the Tunturi C80 Elliptical crosstrainer, the Scandinavian company moves into the commercial grade market. While designed for in-home use, it meets the high standards set for commercial elliptical machines. 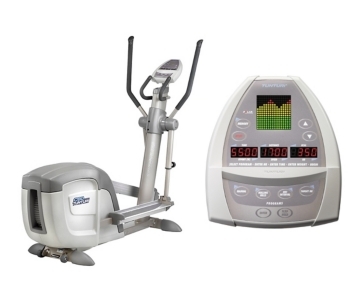 At first glance, you might think you’re actually losing with the Tunturi C80 elliptical crosstrainer when comparing it to the C60 model, but what you’ve lost in some areas are made up for in others. For instance, you don’t get 20 memory spots for personal workout profiles with the Tunturi C80; it’s been reduced to 8 memory spots, but this is to provide more complexity in the display console and a more solid over-all machine. This crosstrainer can take a beating – it’s designed for the most serious at-home user who can use it for several hours every day. You can also save your most recent workout with the Tunturi C80 elliptical for use the next time you crosstrain. It’s a great way to prevent backsliding. UPDATE: This model has been discontinued. If you want to see their latest lineup here is a link to the official site. For a comparable brand with even more features take a look at NordicTrack ellipticals. More power, a solidly designed, heavy duty rear flywheel and the electromagnetic breaks all win approval from fitness professionals. They note that the quality of this “light commercial” crosstrainer lives up to its name – you can really punish the Tunturi C80 elliptical trainer with intensive workouts and get good performance. People who own the Tunturi C80 say that the Interface training guide, while considered a novelty by those who’ve been using elliptical crosstrainers for a while, say it helps them develop a properly designed program and take advantage of many features they otherwise might not have used. We’re practical when it comes to elliptical machines, so what got our attention with the Tunturi C80 elliptical crosstrainer was something pretty basic – the stride length. By increasing the stride to 18.5” on this model, Tunturi has vastly improved the elliptical motion. You get a smoother glide and a better workout with the Tunturi C80, particularly on the rear areas of the legs and glutes. At $2,300 you shouldn’t get a stride less than eighteen inches, so they were right on the mark to remember to upgrade this in addition to adding some high-end features. With 32 levels of resistance, there’s no way you can’t customize your workout and fine tune it. There are very few elliptical machines, if any, in this price range that have this many levels of resistance. With a three year warranty and the heavy-duty construction, the Tunturi C80 elliptical crosstrainer is a wise choice for the home gym of any really serious workout nut.